This study investigated ways to attain mutual, reciprocal awareness of recipient’s availability status in Instant Messaging (IM) applications. For that purpose we designed, implemented and tested a prototype of an IM system named DoNTBother. 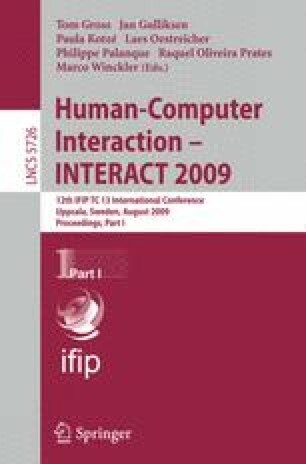 The analysis of the quantitative and qualitative results showed that displaying status indication in the chat box encouraged participants to show more respect towards the communicative state of their colleagues comparing to situations, in which the status indication was presented only in the ‘buddy list’ view. These findings empirically confirm the importance of reciprocal awareness as defined by Erickson and Kellogg  who argued that, to stimulate social behaviours, systems need to maintain the mutual knowledge of who knows what of the information that is shared among users. The study also showed that mutual awareness needs to be maintained not only during communication initiation but also throughout the entire communication duration. To achieve that Instant Messaging systems need to: (i) support indicating the time frame for answering messages in situations when the recipient is not instantaneously able to engage in a conversation, (ii) support specifying the urgency of a message and also (iii) support indicating communication breakdowns especially if they are caused by a reason occurring outside the application domain.